This article was peer reviewed by Jérémy Heleine and Marc Towler. Thanks to all of SitePoint’s peer reviewers for making SitePoint content the best it can be! When speaking of workflow tools, there’s no doubt that both Trello and Zapier play a significant role in the lives of many developers. Trello manages tasks while Zapier automates them. This makes this pair a powerful combination. 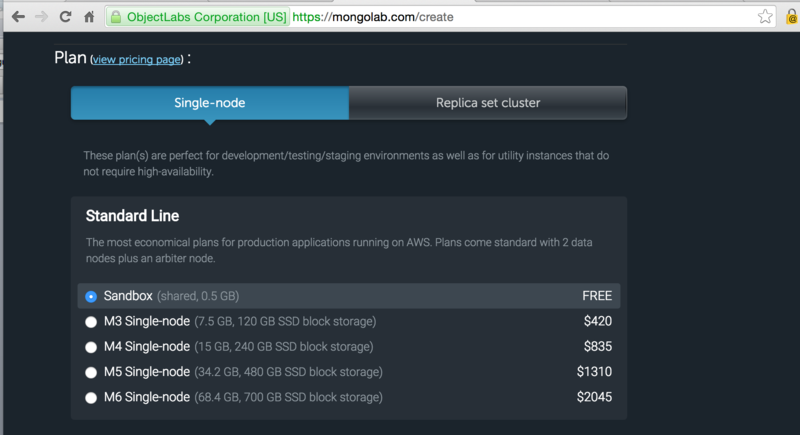 By the end of this article, we’ll have wired up a form that posts to a MongoDB instance set up on MongoHQ. Additionally, we’ll tie it to Zapier, so that it creates a new Trello card every time there’s an addition into our users’ collections. Trello is a task manager that excels in providing assets such as markdown support or shortcuts. It makes managing tasks an overall easier process. Here at SitePoint, we rely on Trello each day in order to effectively develop content from an idea to an article. Throughout the editorial process, we make use of a number of different boards, which are an essential part of Trello. We have a card for each article. These cards often include outlines, links, and other things relevant to the subject. With that in mind, there are tons of different ways in which Trello can provide benefits in the form of organizing information relevant to your life. Today, we’re going to make use of Trello, combine it with Zapier, and create something that will amaze you. By the end of this tutorial, we’ll have a form that creates a card from the information passed into it. Below we can see an example of a card that will be generated using the data sent to our form. For those of you who don’t have a Trello account, you can create one in a few minutes. When registered, we’ll create a new board and a list soon, and we’ll generate items inside this list in the form of Trello cards. When running this command, we’re asked a series of questions about our project. The way you configure these ones, it’s up to you. However, we want to make sure that we enable mongoose for data modeling. Below, we can see a screenshot of the command line in the process of build our example application. Once angular-fullstack creates our app, we have to make few changes. 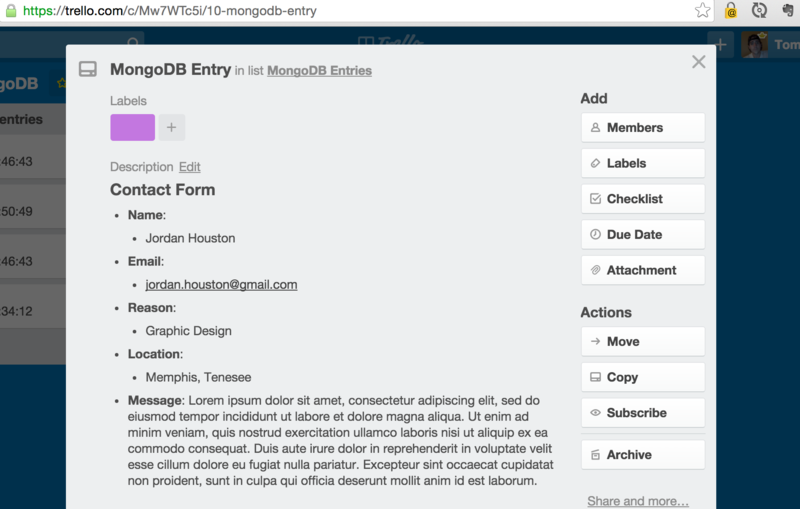 Firstly, we add a mongoDB instance to our application. We’re going to use grunt serve to run our application, so it’s going to look for a local database configured inside of server/confi/development.js file. After all, this command is going to start a complete environment for developing M.E.A.N. start applications. Nevertheless, we need our application to interact with a database hosted at mongolab.com, which is a well-known MongoDB provider. Signing up for an account is extremely easy. Those who don’t have done it yet, should do now. Add a user to this database. When creating a new database, we’ll have to request the amount of space we want our application to hold. In this tutorial, we just need to create a single cluster database. Below is an image on the mongolab dashboard. It shows a database named user-db. There are few things we need to note in this page. First the Mongo URL, that we’re going to pass into our application so that any requests to a database interact with this instance. To make use of this database, we also need to create a user for it. Additionally, the username and password for our database user are important because they’ll be needed to add this instance to our application. Once a database has been created, we need to set it up so that we can make a successful call to it. To start, we modify the development.js file that we mentioned earlier, which is located inside our server/config directory. When successful, the file should look like the code below. The next thing we want to do is create an endpoint to post our user documents too. When using the generator we’re using, we can easily generate different pieces of code for both the client and server side of our application. In this instance, we’re going to use this tool to command to generate an endpoint for our application. By running the following command, we can generate the files we need to interact with data located in the user collection. When prompted with any questions, we can just hit enter and use the default setup. The result will be a user endpoint located at api/users. Additionally, we have generated a new folder located in the server/api directory called user. Inside this directory, the angular-fullstack has created a schema we can post data to. Do you remember when you’ve been asked if including Mongoose for Data modeling or not? Well, here is where we’ll use it. Great! We have created an endpoint, made the correct modifications to our schema, and we are ready to go! We learned before that we can use grunt serve to start out app. If everything goes well, Grunt will open up a browser and allow us to make modifications to our files without having to restart the server. 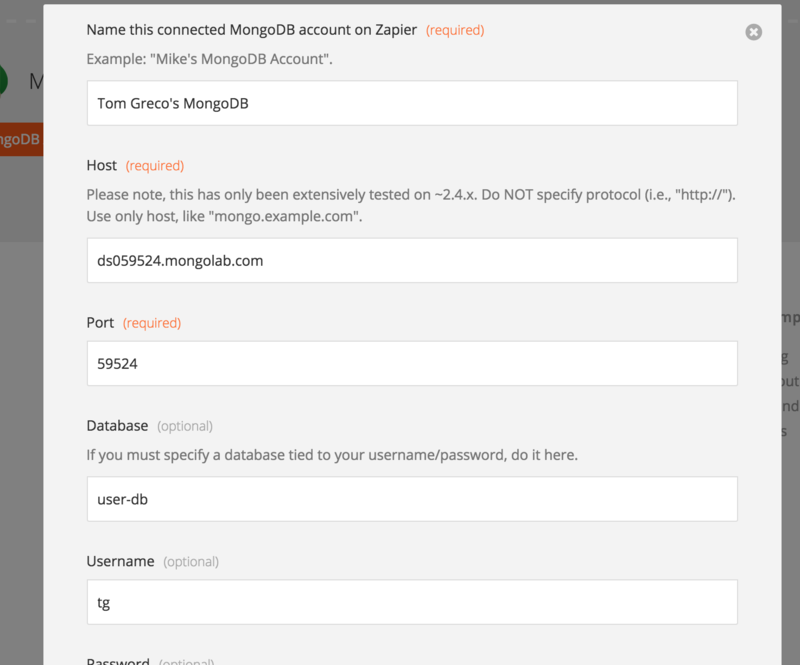 It’s important to note that this would usually require us to run a local instance of a MongoDB using the mongod command, however we modified the development.js file to reference our database hosted via MongoLab.com. That said, let’s continue on and configure the client side code for our app. We can easily generate a new route by running yo angular-fullstack:route <route-name> inside our project. However, we’re going to keep it simple and work with the files inside of the main directory this application came installed with. Specifically, we’re going to make changes to the controller for the main state, as well as the template file. By default, generator-fullstack includes some API calls inside this controller. Although they’re not necessary for this example, they do show live examples of Angular’s http module, and help to provide the users with a solid start point. The choice to keep or remove this code does not matter, however we need to add some code. We would usually pass the HTTP module into our controller, but since this application is already interacting with our API, we can begin writing our post call right away. By taking a look at the code below, we can see that there is now a sendForm() function inside this controller. Let’s break down exactly what is going on here. A variable named data is created. Inside this variable we set the $scope of all the properties we defined inside our schema on the server. This will allow us to access these properties using the ng-model directive. A http.post call is made to the /api/user/ route, which is the location that we specified while generating the user endpoint. This ties the post call to the new input data, so every time the sendForm() function fires off, this call is going to add a new user to the users’ collection. The last thing we do is reset our form by setting the $scope of all the properties in our schema to an empty array. It might seem a hacky method, but it’ll be fine. Firstly, we’ll remove all the content inside our container. Inside our opening form tag, we need to include the ng-submit directive and give it the value of sendForm(). Then, we need to tie this form to our data models. To do this, we’òò create few input fields which will hold our ng-model directive. Additionally, each ng-model will be passed in the name of the property it corresponds to. Finally, for the sendForm function to be executed we need to create an onsubmit event. To achieve this goal, we’ll add a button to the bottom of our form and declare it as type="submit". See the Pen yeojBr by SitePoint (@SitePoint) on CodePen. Taken for granted that all our code is correct, we should be able to fill this form out and make a post request to our database. If successful, we’ll see the POST /api/users 201 displayed inside our command line. Additionally, this will also result in the users collection. Now it’s time to sprinkle Zapier into the mix. We’ll need a Zapier account in order to make this thing work, and we can create it for free at Zapier.com. When signed in, we’ll see a dashboard panel that will allow us to Make a New Zap. Choosing this will prompt us to do two things, described in the next section. 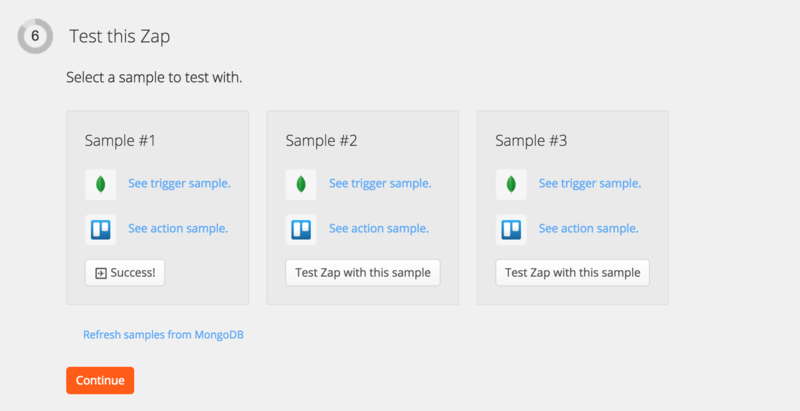 If we select both the trigger and action applications, we’ll see that Zapier provides the ability to tie a number of different technologies together. 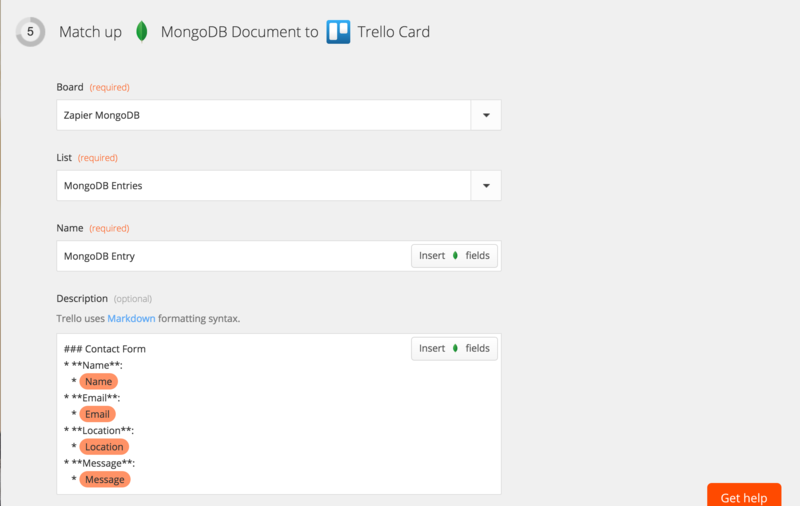 In this instance, we want MongoDB to trigger Trello to create a card every time there is a new document added to a collection. We need to sign into both our Mongo and Trello accounts in order to make this happen. I have included an image below to provide an example of how the Mongo instance should be set up. Additionally, it would be a good idea to test these connections and make sure they’re working fine. We should have already specified the database in step 3, so now we just need to specify Zapier to watch the users collection. This is the step that allows us to define the style of our card. Additionally, we can see the Markdown syntax I used to create the example we saw at the beginning of this tutorial. By clicking the Insert Fields button, Zapier will allow us to choose exactly what data to include. The most powerful part of this step lies within the description. Since Trello allows the Markdown syntax, we can make easily readable cards each time we are contacted. Although there are a number of things we can add to this card, we’ll leave it as it is and go on with testing. At the bottom of the page we see that Zapier gives us the ability to try this new ‘Zap’ out, so we should go ahead and do it. If successful (as it should be), we’ll be able to see a new card added to whichever board we’ve specified in step one. Again, this calls for another pat on the back as we did a really good job! In this tutorial we have learned a lot about two useful development tools: Trello and Zapier. Hopefully you’ve gained some new insight on these technologies and understood that the Web provides us with so much great resources that it would be a shame to waste them! As always, feel free to reach out if you have any questions and share your thoughts in the section below.